This weekend it was our time to start planting a few things in the garden. Last week we added a tulip plant to the garden as well as a new mint plant, but this week we started planting a few vegetables. Unfortunately I haven't got room for a walk in greenhouse so I have to make do with a small patio greenhouse which too be honest does us fine. Having been sat there doing nothing during the winter we are now making use of it. This week we planted up a couple of courgette plants which always seem to do well in our garden. Every year we also grow a couple of sunflowers, one each for the girls and see which one grows the tallest, I think Mia's won last year and it was just over 8ft tall. We have also planted the first seeds in the garden. We tend to plant ours in cycles that way we should have enough till about September time. The first lot included spinach, spring onions, lettuce and beans. These are all undercover now and we will probably plant the next batch in 2 - 3 weeks. 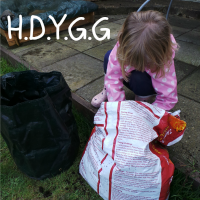 The girls favourite thing to grow in the garden is potatoes, and we have just planted our first two sacks of the year. We tend to grow simple new potatoes as they are versatile and the girls love them. At the moment we have just planted two sacks but we will probably have about 5 - 6 which will save a lot of money during the summer. And that is what we've been up to in the garden this week...next week we will be planted a few more things and also planting a few hanging baskets.